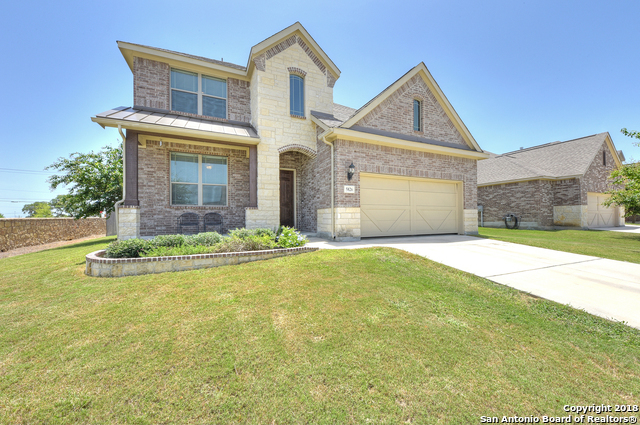 All LONESTAR AT ALAMO RANCH homes currently listed for sale in San Antonio as of 04/23/2019 are shown below. You can change the search criteria at any time by pressing the 'Change Search' button below. "Luxury living 1.5 Story with NO city taxes. Stunning stone & stucco elevation. Over sized floor tile at entry and main areas, with high ceilings & open floor plan. Gourmet kitchen features large island, built-in SS appliances, gas stove, & double oven, granite counters, with stylish back splash. Everything you need is on the first floor with a game room upstairs. All bedrooms downstairs. Plus a study! Located in a gated community. Radiant barrier in roof, 2 water heaters, and large covered pa"
"Desired Area & most convenient of Alamo Ranch on Corner Lot.Gorgeous,Well Maintained 4 Bdrm 3 1/2 bath w/2939 sq. ft. Tile Entry. Family Rm.w/Fireplace. Gourmet Kitchen w/Island,Granite Counters,Gas cooking & Eat in kitchen w/Bar & Ceramic Tile Backsplash.Study/Office w/wood floors w/French Doors.Master Down w/Bay window.Master Bath w/Sep. Tub & Shower & DBL Vanities & WIC.Huge Gameroom upstairs w/3 Bdrms & 2 Full baths.3 Sides Masonry w/Extended Covered Patio.Great Schools.Easy access to hwy 15"